Blogging will be light for the next week or two while Carol and I enjoy not one, but two family reunions in Utah this Saturday and next. We went and saw Les Miserables last night at Tuacahn in St. George. What a treat. Outdoor theater with a great sound system where every seat has a wonderful view! We could tell there was going to be trouble when the bus driver sped up and told everyone to duck down. Rocks started crashing through windows. Women and children were screaming. Our hearts started to race but there was nothing we could do. We held on for dear life. What were we doing down here in Central America in the middle of a revolution? We didn’t come here to fight. We came to tell people about a way of living together in peace as families. We loved these people and enjoyed visiting them in their homes and in their churches. Luckily nobody was hurt. The bus driver got us to our destination safely but he was not happy at all the broken windows. “Damned kids,” he shouted. Those weren’t kids. They were local college students unhappy with the way things were going in Nicaragua at that time. They were trying to kill us or at least destroy property. They would have turned the bus over and burned it if it had stopped. That was their way of protesting the corruption in the Somoza government. We could have easily been seriously injured in this particular incident. We hurried the rest of the way to our home that night on foot. The whiff of a tear gas canister caused us to choke and cough while a helicopter overhead shone a searchlight on us. They were shooting at the groups of kids who were throwing the rocks and burning the busses. Luckily they saw our white shirts and ties and saw that we were gringos. “CIA, go home,” they shouted in Spanish through the loudspeaker. But we weren’t with the CIA. Can you guess who we were? Extra credit if you can guess the year. I know, it wasn't that hard, was it? I didn't think much of this incident at the time it happened. I guess I just figured that it was normal for our mission, but it soon got out of hand. As the revolution took the country by storm, missionaries were trapped in their homes for days. Worried parents called the mission home. President Muren left the comfort of Costa Rica, traveled to Managua and did all he could to help the members find some peace and to get the missionaries out. He was successful, but not before some very close calls. You can read a few of them on this page from out last mission reunion. I loved my mission. I loved serving in Central America. I loved the people. I loved the culture. I loved being able to serve in four different countries. What an amazing thing for young people to spend two years of their lives to share the gospel, and pay for the privilege of doing it. I learned to work hard. I learned how to get along with difficult companions. I learned to be responsible for an area, a district, a zone and a branch. I learned that success comes when you do things the Lord's way, and especially when you follow the promptings of the spirit. I had a companion in Panama (San Miguelito) who bought some firecrackers in the Canal Zone and lit them all up and down the street as we were tracting one morning. The neighborhood kids loved it. Believe it or not, it may have been because of his firecrackers that we found, taught and baptized a golden family. For some reason, Elder Pierson wouldn't come to the door with me that day. I think he was mad at me for something. So I was doing the door approaches by myself while he stayed out in the street. Just as I introduced us as representatives of Jesus Christ - Boom! - he blew one up in the mailbox. I didn't know what to say. After a moment of stunned silence, Sister Delgado just laughed and laughed and then invited us in. We had a wonderful discussion and came back that night and taught her whole family. We developed a close relationship and a bond of love that I still feel to this day. 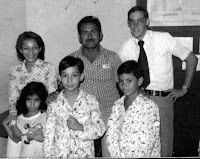 Teaching and baptizing this family helped me to find great joy in sharing the gospel. I hope my wild bus ride and the missionary blowing up firecrackers does not cause you to think any less of the missionary program of The Church of Jesus Christ of Latter-day Saints. In some ways, missionaries are like Paul whose life was endangered while teaching of Jesus Christ. Yes, some LDS missionaries have been killed over the years as they have gone about sharing the gospel. But the statistics are amazing when compared to ordinary death rates for 19-20 year old boys. What better way to spend these years then in serving a mission in the service of the Lord? I loved reading this post. You had some unique mission experiences! The firecrackers were certainly an "interesting" approach! It sounds like that family was waiting to hear the gospel message in spite of how you arrived - lol! Your mention of President Muren brought back a flood of memories for me. Bro. Muren taught at Ogden Institute at Weber State College were I was involved in the music activities. I loved his classes and can still see his short legs rushing down the hallway. I really respected that man.